This entry was posted on July 27, 2006 at 3:40 pm	and is filed under Churches, Ilocos Norte, National Cultural Treasures, National Historical Landmarks, UNESCO World Heritage Sites. You can follow any responses to this entry through the RSS 2.0 feed. You can leave a response, or trackback from your own site. The town of Paoay seem to be isolated from the rest of Ilocos Norte, so enclosed the town is surrounded by tall, old mango and acacia trees, that a newcomer would not know what to expect. Only the tip of the belltower exerting itself to the sky gives a hint of what lies beyond the fortress of trees. At the end of the long, narrow road leading from the Manila highway to the town proper, the hundred-year-old Parish Church of Saint Augustine awaits silently, considered as one of the most striking edifices in the country with its huge buttresses flanking the sides and rear facade. It has been a wonder how and why such huge wall reinforcement was ever fancied by the early church builders. Was it just another way of impressing the people by demonstrating the strength of the new religion–that is, Christianity–or was it just a result of the rivalry among Catholic church builders who were trying to outdo each other? The answer is more humbling and simpler. Earthquake was, and still is, one of the most destructive natural calamities in the Philippines. This harsh reality is severely evident in the church building practices in the Ilocos. As a response to earthquakes, church builders devised means to make sure that the church held up against the fury of the earth. Wall buttressing was a promising solution because it required a simple building method and simple materials. In the case of Paoay church, however, the dreadful paranoia of church builders became the epitome of earthquake-resistant churches in the Ilocos region. The church was started by the Augustinian Fr. Antonio Estavillo in 1694. It was completed in 1710 and rededicated in 1896, just three years before the expulsion of Spanish rule in the country. The style of the church has been dubbed “Earthquake Baroque” by Alicia Coseteng, one of the early authorities on colonial church architecture. Because the buttresses extend out considerably from the exterior walls, the entire visual experience becomes three-dimensional, unlike most of the churches in the country where the inherent beauty of the church is limited only at the facade. The buttresses are a visual spectacle. One can easily imagine them as giant sentinels poised to protect the church from adversaries. The rhythmic flow of massive form cascading down from the pinnacles to the ground, emphasized by spiral relieves visible on each side of the buttresses, alludes to a Baroque character. Yet, the dark receding plaster and exposed coral stone wall, complete with foliage overgrowth, creates a momentary feeling of being in some exotic Javanese temple. The materials used for the walls were a mixture of coral stone and bricks. Large coral stones were used at the lower level of the walls, while bricks, smaller and more manageable to transport, were used at the upper levels. Another unusual idiosyncrasy that seems to be typical to many Ilocano churches is the existence of a step buttress at the sides of the church, at or near half of the length of the exterior wall. There seems to be no other reason for building this other than as a means to access the roof. In the early days, this would have been necessary when fixing or patching the cogon grass roof. What throws off everyone’s speculation is that the stair-like buttresses have steps that were built too steep and too far apart for a normal person to climb. But perhaps, they were built in such manner in order to save valuable space. If the step buttress on the left of the Paoay church was built properly, it would have jutted out far beyond the boundaries of the church fence. The facade of the church, even as it is beginning to lean towards the front, still manages to be as equally impressive as the buttresses. Viewed from the side, the giant buttresses look like huge volutes making the facade appear as a massive pediment rising from the ground. The facade is divided vertically by square pilasters that extend from the ground and all the way to the top of the pediment. The Gothic affinity of the church is suggested by the vertical movement of the pilasters and the finials that cap them at the top of the pediment. The facade is also divided horizontally by stringed cornices that extend all the way to the edges. The cornices extend to the sides of the church and wrap each buttresses around, adding attention and articulation to the massive side supports. At the apex is a niche, while the otherwise stark plaster finish is embellished with crenallations, niches, rosettes, and the Augustinian coat-of-arms. The facade is complemented with a belltower located at its right hand side. Belltowers are a very important element in the overall composition of colonial churches, both for its function and aesthetics. For practical purposes, belltowers were used as a communication device to the townspeople. In the case of the Paoay belltower, it also played, ironically, an explicit role in the lives of the Filipinos during the war. Climbing the belltower is almost like going back in time. Inside, the musty smell of coral stone, coupled with rotting wood scaffoldings and stairs, relives the dark days of the Katipuneros when they climbed up and down the shaft and used the belltower as a lookout during the revolt against the Spaniards. The view from the top of the belltower is absolutely magnificent. On one side, one can roam with his or her eyes the vast span of land until it merges with the China Sea. In some sense, it is still used today as a lookout point, not by the Katipuneros, but by mischievous kids from the nearby high school who often flee from the wrath of an angry teacher. As one enters the edifice, the church abruptly relinquishes the powerful strength of the massive buttresses that they discharge at the exterior. Inside, the church has a very solemn, almost sentimental ambiance. The interior looks bare and empty. Regalado Jose mentions in his book that the ceiling was once painted with a scene similar to that of the Sistine Chapel in Italy. Unfortunately, the original ceiling is no longer in existence today. What is left is a cavernous maze of trusswork with exposed and rusting corrugated roof sheets. Compared to its still magnificent exterior, the Paoay church looks austere and stark inside, with but a few old images of saints and a simple wooden cross at the altar, that it is hard to imagine now how it looked like a hundred years ago. Only on Sundays does the Parish enjoy quite a number of worshippers. It is sad to think that on any other day, except for an intermittent bus loads of Taiwanese tourists, the church suffers from the lack of patronage. It is impossible not to be compelled by the exotic quality of the church, as demonstrated by the huge and powerful buttresses. Yet, there is also a sense of humility behind such exuberant assertion, as expressed by the pensive interior. But the most enduring impression, perhaps, that any visitor takes with him as he departs from the church, are the poignant memories of a tumultuous yet glorious past of a nation, imbedded among the layers and heaps of huge stones and bricks that make a church. Is there any historical information on the ruins beside the Paoay church? i was born here! i stil remember playing around the church during my childhood. such a nice place! well-known blogger should you aren’t already. Cheers! it is triggered by the sincerness communicated in the post I looked at. 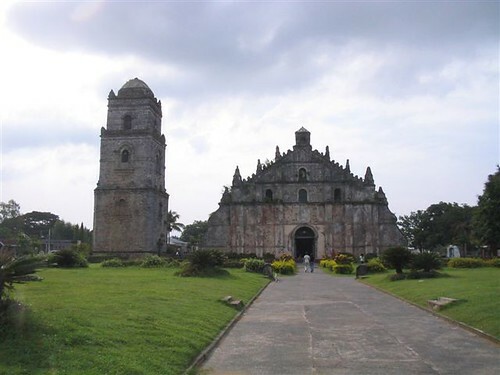 And after this article Paoay Church � Heritage Conservation Society.
) I actually do have 2 questions for you if it’s allright. Is it just me or do a few of the comments appear like they are written by brain dead individuals? 😛 And, if you are posting on additional social sites, I’d like to follow you. Would you make a list all of your community pages like your linkedin profile, Facebook page or twitter feed? Hi there, just became alert to your blog via Google, and located that it is truly informative. I valued your explanation of ‘Earthquake Baroque’ a term I first saw used when I visited this beautiful church about 10 days ago. Actually, I’d sort of worked out the explanation of the style myself just looking at the wide, low front elevation of the church and the immensely thick walls and buttresses. I didn’t work out the purpose of the step buttress but it makes sense, although I wondered at the time of viewing whether they were an influence of the ‘inca’ type pyramids of Mexico, given that The Philippines were ruled mostly from New Spain (Mexico) until it obtained independence from Spain. I didn’t know about similar churches in Guatemala.